From beginners to experts, children to grandparents, Western to English, we have a horseback riding experience for everyone. We are truly a unique equestrian center offering a broad range of equine activities for the Truckee Reno Tahoe area including summer horse camps, scenic trail rides, and training in both English and Western disciplines. Our focus is on helping individuals communicate and connect with their equine partner. Out here, no words, text messages, or photos will connect you with a horse - you have to show up, take a chance, and find a way to connect on a natural level. Are you up for the adventure? Horseback Riding in the Snow! At Piping Rock, we are the only trail ride operation in the Tahoe/Truckee area that allows guests to ride in the snow. Escape the ski lines and the crowds and join us for magical views. It is truly an incredible holiday experience. This Thanksgiving holiday season Piping Rock will donate 20% of your trail ride to the American Red Cross to help aid California wildfire relief efforts. So far we have already donated $1,000. Come join us on Saturday October 13th for a fun filled day of activities including Trail Rides, Pony Rides, Petting Zoo, Games, Food, Music & more! Admission is free. Some activities require a donation to participate. All proceeds go to helping local Tahoe Truckee kids with the horse programs! Ultimate Tahoe Adventures Host Dreu Murin took the short drive from Reno for us to show him around our place in Truckee, California. Check out what Piping Rock offers in this great episode featuring trail rides and a short lesson - a great intro to horseback riding in the Truckee Reno Tahoe area. Thanks Ultimate Tahoe Adventures for featuring us! We offer trail riding programs that are less crowded, less dusty, and more personal. If you owned your own horse, this would be a ride that you would share with your friends or family. Our trails cross mountain streams, meander through Jeffrey pines with the smell of sage is in the air. This is the Tahoe that you love. We offer week long summer camps for children ages 4-16. Camp is a great way for children and teens to learn about horses and to advance their riding skills. Featuring quality instruction, well behaved horses, and a fun supportive group environment, we pride ourselves on a quality experience for each camper. Sierra Riding Academy is for serious students who want to take their horsemanship to the next level. Instruction & training are offered in equitation and jumpers year round with a focus on safety and sound horsemanship fundamentals. Not just for locals, SRA also offers seasonal lesson packages and school horse leases for visitors. Our talented staff of trainers and instructors can help you get your horseback riding and horsemanship to the next level. From private one hour lessons to all day clinics, we have a range of programs available in both Western & English. After a few years of hard work helping introduce people to horseback riding, many of our horses are ready to go to their forever home. The bond between horse and owner is special and unfortunately very difficult to cultivate in our commercial setting. So take a look, maybe you will find your equine match! Find out more about our philosophy, our staff, frequently asked questions and guest testimonials. 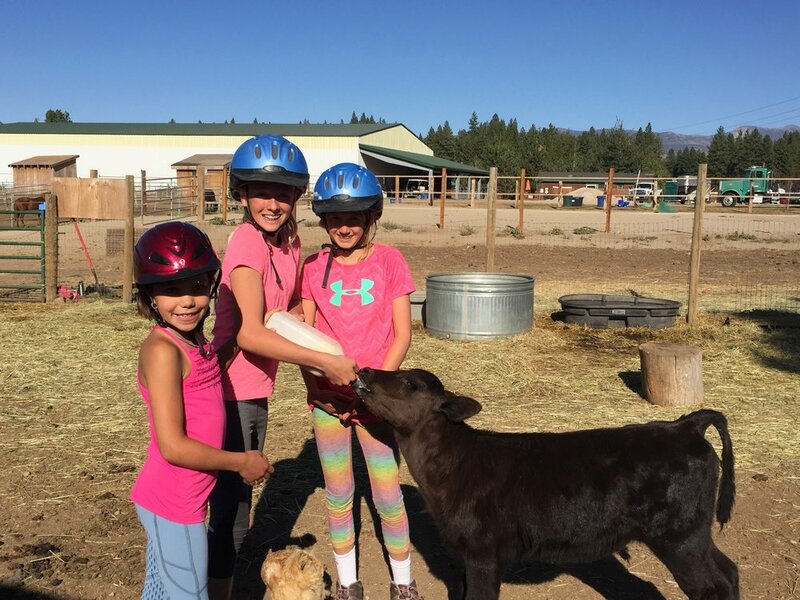 Tahoe Horse Kids is the entry level program for kids. After a pony or trail ride, interested kids can gain exposure to the wide world of horses in a safe and friendly environment. Instruction is offered in both the Western & English style with a focus on safety and sound fundamental horsemanship. THA is primarily offered after school in the Fall, Winter, and Spring. We offer boarding both in our barns and outside in paddocks with a total capacity on site of 80 horses. We have 2 barns with 16 12x12 stalls with 12x16 run-outs each as well as multiple shared outdoor paddocks and pastures of different sizes. We offer training for both performance and pleasure horses. We offer birthday party and special event packages both on-site and at your location. From ponies and a petting zoo for a birthday party or school event, to jumping demonstrations or horses for weddings, we are here with our animals to make your event that much more memorable! Check out the latest Piping Rock news and events! Sign up with your email address to stay up to date on all things Piping Rock! We respect your privacy and will not share your information with anyone for any reason.